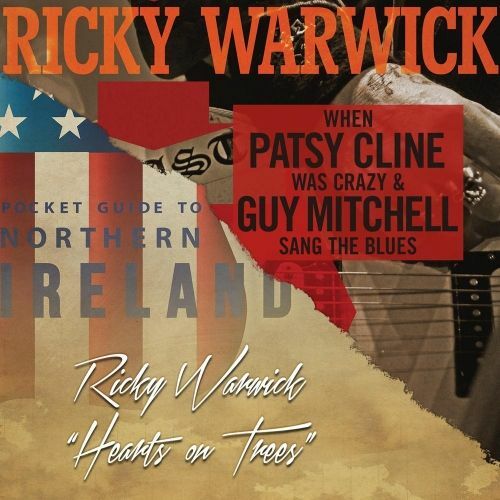 Ricky Warwick's double album, 'When Patsy Cline Was Crazy (And Guy Mitchell Sang The Blues)' and 'Hearts On Trees', was released in February of this year. With guest vocals by Jake Burns (Stiff Little Fingers) the song, as the 100th anniversary of the battle approaches, is a tribute to the young men of Ireland North and South, Catholic and Protestant who gave their lives in what was to ironically to be labelled the war to end all wars. The video's inclusion of war-time images only adds to the poignancy of this fateful point in history during the summer of 1916 in Northern France. Both albums boast an array of acclaimed musicians with guests including; Joe Elliot (Def Leppard), Damon Johnson (Thin Lizzy/Black Star Riders), Andy Cairns (Therapy? ), Billy Morrison (Billy Idol), Nathan Connolly (Snow Patrol), Ginger Wildheart, Jake Burns (Stiff Little Fingers), Richard Fortus (Guns ‘N’ Roses/The Dead Daisies) and Mark Thwaite (The Mission, Peter Murphy). The artwork for the double albums reflect the tone of each - ‘When Patsy Cline Was Crazy (And Guy Mitchell Sang The Blues)’ showcases the electric rock and roll side of Ricky, whilst 'Hearts On Trees' veers more towards tender stripped-back songwriting, influenced by both Americana and, more importantly, Ricky's Northern Irish roots. Ricky and his band The Fighting Hearts featuring Robbie Crane on Bass (Black Star Riders), Guitarist Mark Gemini Thwaite (The Mission, Peter Murphy) and Drummer Gary Sullivan are back on the road for a UK Tour in November & December. *Vice Squad not on these dates. We have “Celebrating Sinking” on The Friday NI Rocks Show on 17th June.